JANUARY 22, 2019 • Stay Connected! I’ve always been under the impression that when a buyer sends notice for additional inspections then the initial timeframe is void and buyer only has the additional timeframe to reply. For example, Buyer has 7 days for initial inspection. On day 1 they conduct inspection and give notice for "additional inspections" for roof issues. Additional period is 2 days. Does buyer lose all remaining days of the initial period and now only has 2 days to reply or is that additional 2 days tacked onto the end of the initial 7-day period? Broker's understanding of the operation of the form is correct. Once a buyer delivers notice of additional inspections, the buyer's original inspection time period ends and the additional inspections time period begins. Once the additional inspections time period ends, the buyer's inspection contingency ends. Using the days given in the question, buyer's original 7-day inspection contingency was cut short by the delivery of the "Additional Inspections" notice. With delivery of that notice, buyer reduced buyer's remaining inspection contingency period to only two days. REALTOR® members who have leadership experience at the local and/or state level, but have not yet been actively involved at the national level, should apply to the NAR 2020 Leadership Academy. The Academy is focused on developing participants' institutional, industry, and association knowledge. 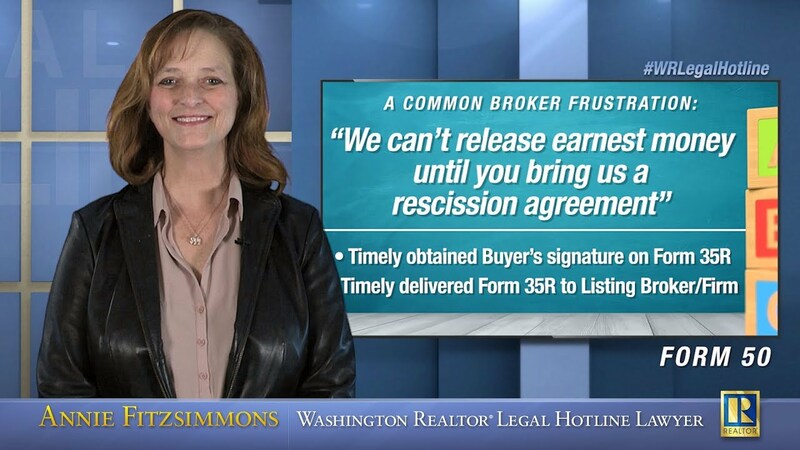 (Annie Fitzsimmons) Washington law is clear: firms must maintain a copy of all transaction folders for a minimum of three years (WAC 308-124C-110(2)) and brokers are responsible for timely submitting records to the firm (RCW 18.85.275(2)). What is often confusing to brokers and firms alike, however, is which records must be stored and when broker is required to deliver those records to the firm. (Sam DeBord) The numbers don’t lie. Most real estate brokers and brokerages are at a severe disadvantage when competing with the marketing arms of the newest advertising platforms in the industry...The individual real estate broker can still rely on hyper-local knowledge to stand out with unique marketing campaigns. Washington REALTORS® from all over are traveling in to participate in this even this week. We have some exciting things happening at "Hill Day" this year. Learn more about our Legislative Priorities and the Unlock the Door for Affordable Homeownership initiative. Don't forget to download the Event App to access meeting materials, event info and more. This class covers legal duties relating to red flags, common red flags, sources of information, steps in handling red flags, risk shifting tools, and how to recognize and handle these situations. This class takes a light-hearted, but serious, look at real life examples of drafting nightmares. This short-course on contracts covers common drafting errors and how to avoid them. The real estate industry has become more complex than ever before and having access to a real estate attorney is ideal for your business. Enter Annie Fitzsimmons; the Washington REALTOR® Legal Hotline Lawyer! Promo name: 2019CE. Expires on: 11:59PM PST January 31st, discount amount: 27%. Code: 2019CE (any combination of capitals/lowercase will work) Restrictions: Cannot be combined with any other offer. Can use as entire cart discount or individual products. Unlimited use until expiration date.